Reduce the phosphorus in your pond or lakeshore that weeds and algae need to grow. PhosControl® reduces the amount of nutrients that are available for the weeds to grow. PhosControl® bonds with phosphorus, making it unavailable to aquatic plants and algae. Each pound of phosphorus will produce 500 pounds of aquatic plant/algae growth; the use of PhosControl® is very important. 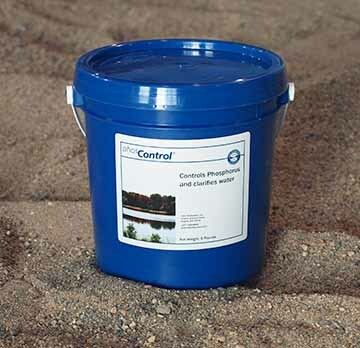 PhosControl® controls phosphorus and clarifies water. Restore your pond's health by reducing the nutrients that enable weeds to grow. Phosphates are the main source of food for algae, and algae cannot survive without phosphates. Eliminate the phosphates, and you eliminate the algae. Refer to product label for complete instructions. See our Video Demonstration to view how easy it is to apply PhosControl®. Orders are usually shipped within one day by ground carrier. US Shipping Only. International Shipping available for the TORMADA®, Goose D-Fence®, LAKEMAID®, and select products. Certain regulation apply for shipping to AK, AZ, CA, CT, HI, MA, ME, NF, MY, VT, and WA. Please contact us if you liv in one of these states: 1-877-428-8898. I use this product in my pond management business consistently with very good results. I prefer it with Pre - Spring treatment, or pre emergent. Usually with a dye and or algaecide.